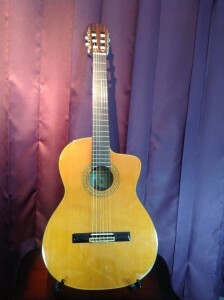 This in my true classical guitar, an all solid wood Cordoba C10, spruce top, rosewood back and sides, ebony fingerboard. I have an L.R. Baggs Lyric classical internal microphone installed for amplification. Both of my CDs were recorded using this guitar. 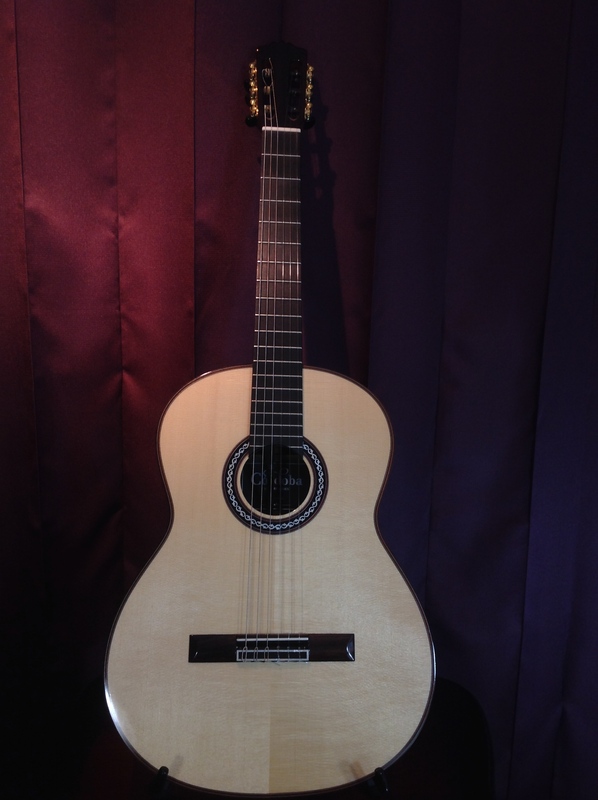 In higher volume gigs where feedback from my Cordoba would be a problem I will play this spruce top Grand Concert Duet by Godin. It’s a wonderful fairly naturally sounding instrument that is highly resistant to feedback at higher volumes. 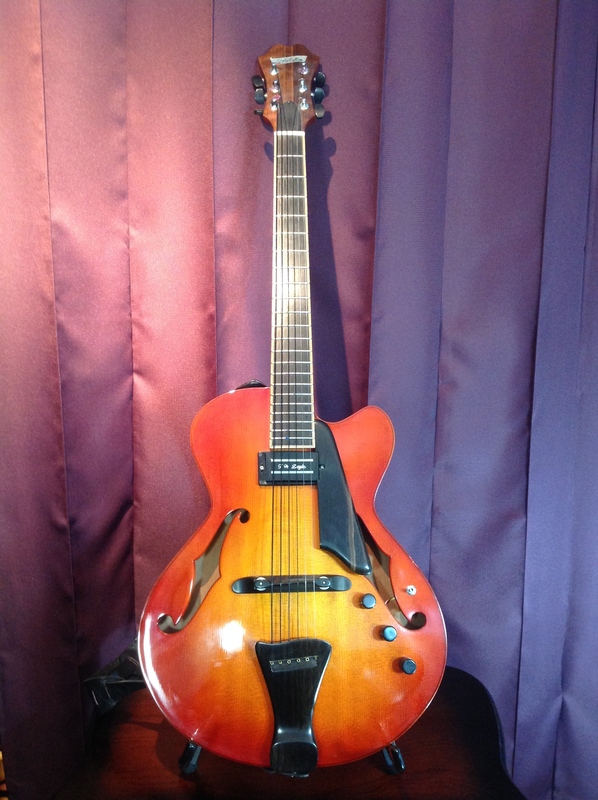 This gorgeous handmade archtop was built by Oregon luthier Stephen Holst. Hand carved spruce top, mahogany back and sides, ebony fingerboard, tailpiece, bridge, pick guard and volume knobs. The pickup is handmade by T.W. Doyle. This is an early 90s Takamine 132CS, solid cedar top classical electric cutaway. 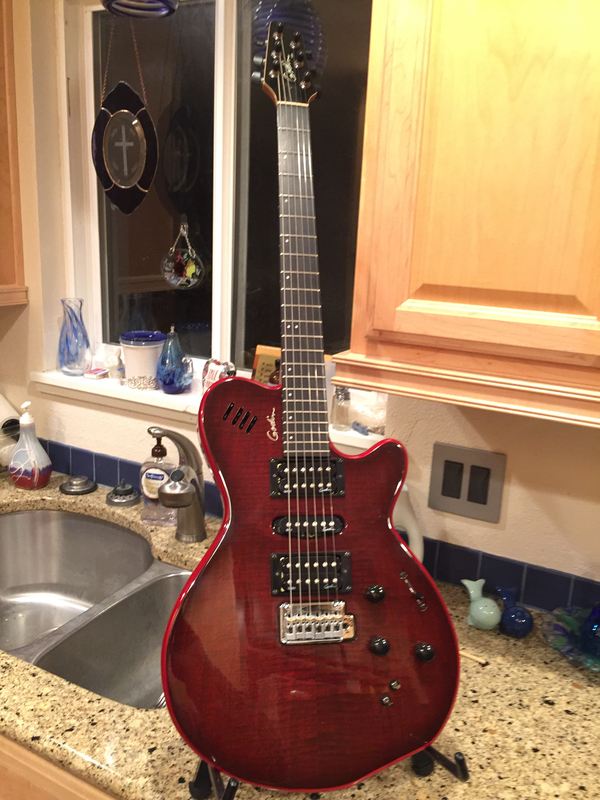 This is my main performing solid body electric guitar. And I know it’s mine because it has my name on it. The brand is Mitchell, which is the house brand for Guitar Center stores. 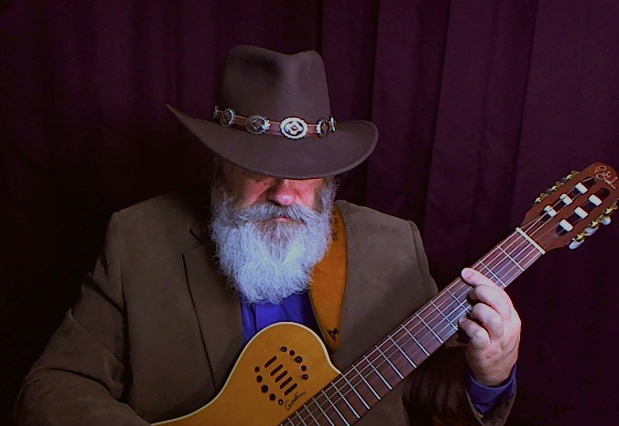 I have since installed a Roland midi pickup which I run into a Boss GP-10 processor which gives me access to an amazing number of guitar, amp and speaker sounds, including alternate tunings and 12 string guitar sounds. It has become an essential part of my live performance. 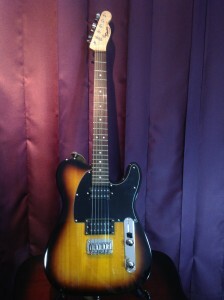 Here’s a Fender Telecaster with humbucker pickups installed. I also have a sea foam green Stratocaster, the first single coil guitar I’ve ever owned. But I don’t currently have a picture of it. I’ll try to get one up soon. This is my newest acquisition, a backup guitar for Mitchell with the Roland synth pickup. 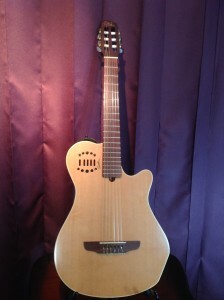 This is a Godin XTSA. 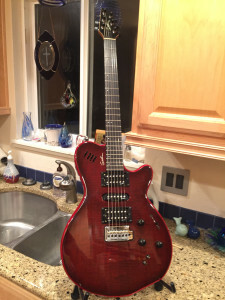 It has a beautiful deep red flame maple top, and a piezo bridge that can produce acoustic electric sounds or output to my Boss GP-10 processor for synth sounds. It also has 3 conventional electric pickups, hum buckers in the neck and bridge position and a single coil in the middle..
For amplification I use a Fishman SA220 Soloamp. For larger rooms, when more power and coverage is required I’ll use QSC K8 self powered speakers with a small Yamaha mixer. For smaller rooms I use a truly remarkable amp called The Bud made by Henriksen, a small boutique amp company in Colorado. It can put out an amazing level of clean sound to fill a room of about 100 people from an enclosure that measure 9″ square. In very small rooms I use a Roland AC-60 acoustic amplifier with a separate channel for my vocal mic.